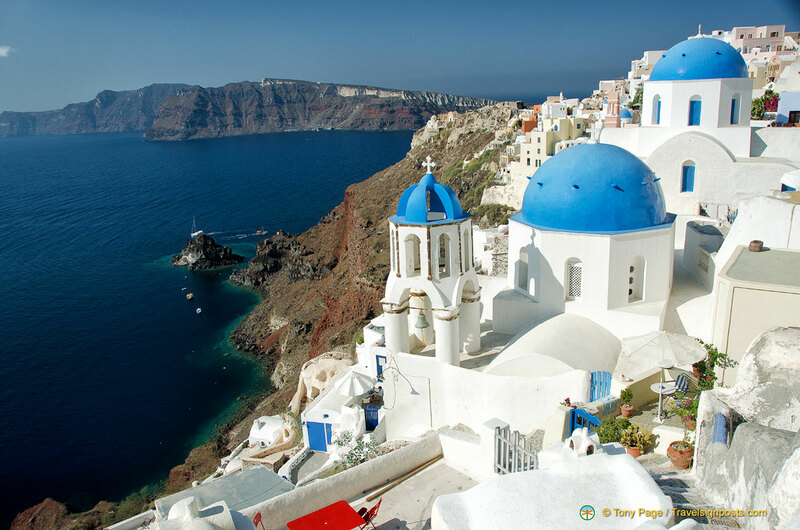 Santorini (or Thira as it is offically called) has always been a popular destination for individual travellers seeking some island adventure or relaxation. However on our latest visit we found that this Greek island is now on the itinerary of many of the Mediterranean cruises, making it the hottest tourist destination in the Greek isles. As a matter of fact Travel+Leisure Magazine ranked Santorini as the world’s top island for 2011. Santorini is part of The Cyclades group of islands, located south-east of Athens. This unique island was born out of a force of nature – a horrendous volcanic eruption that took place over 3,600 years ago. Santorini has shed its old reputation as a backpacker’s destination and the cheap rooms on the cliff-face have been mostly replaced by the vast numbers of luxury suites, smart villas, hotels, resorts and traditional houses. Once isolated villages like Oia, Imerovigli, Finikia and Firostefani have all developed their own cluster of luxury accommodation with caldera views and are accessible by the local bus. Fira, the main town of Santorini is now very densely built up and it is overflows with cafes, bars, discos and restaurants. There are plenty of shops for the souvenir-seeking tourists and jewellery shops are just as prominent. There is even a street called Gold Street. An impressive cable car links Fira to the Old Port area so you no longer have to climb the 588 steps up. The donkeys, once a main means of transportation, are now mostly used for joy rides for the tourist market. Santorini’s caldera is unique – it is the only inhabited caldera in the world. Its white-washed houses perched on the cliff-face of the caldera and the blue domes of Santorini churches are picture-postcard pretty and it is these images that have been used to represent what Greece tourism is all about. The Akrotiri – this is where the archaeological settlement of pre-historic Thira is situated. There are so many hotels, traditional houses and luxurious suites to choose from in Santorini. Firstly one has to decide which village to base yourself. And, is the village accessible by public transport or will you be renting a car? At what level on the cliff-face of the caldera to have your accommodation and how much you’re prepared to spend – Santorini is no longer a cheap accommodation destination. You can see the range of Santorini accommodation, read guest reviews and book your accommodation HERE. Some of the villas and luxury suites look really romantic, but beware of the number of steps that you may have to climb to get to the accommodation. Find out from the people how many steps there are to their premises and note that the steps are not all of equal size. It is common to climb one step and then you take a few paces before the next step. If you intend going to the restaurants, or doing a bit of shopping or sightseeing, think of whether you are prepared to go climb up and down the steps each day.